Hexen II is a beautiful and visually consistent fantasy realm. But what if the gameplay was better? Enter Game of Tomes modification. PeeweeRotA has been asking tough questions during the ongoing development of this Hexen II mod, like “Why doesn’t the necromancer raise the dead?”. “Am I playing the next fusion of fantasy and first person shooters, or am I playing a re-skinned quake?” Check out the design philosopy, features, and maybe some live Twitch streaming. Volatile engine and our friend J.A.C.K. The Volatile Engine and J.A.C.K. booth is really two-in-one. First: the latest incarnation of the J.A.C.K. 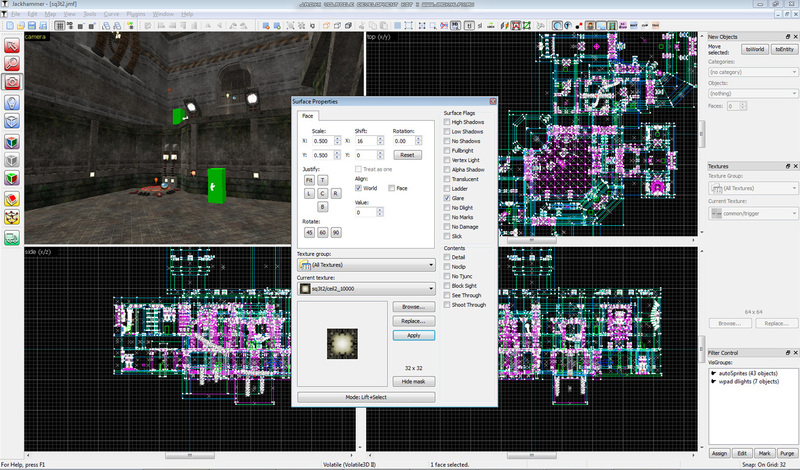 level editor, formerly known as Jackhammer, and recently green-lighted on Steam. This easy-to-learn editor has become a hit because it implements the best features of classic editors. Games supported including Quake, Q2, Q3, Halflife, and several mods and derived games like Hexen II and Tremulous. Second: the as-yet-unreleased Volatile engine supports a slew of modern features, yet is scalable to support older graphics cards. Read the specs or just drool on the screenshots. Engine. Game. Asset creation and management. Epic project. Watch the videos at the Katana Game Engine booth for the beginning of an awesome asset system, including a realtime material preview window and a simple model viewer. The ambitious engine project is the basis for the indie game Decay and is showing much promise. The source code has been made public, although it’s currently undergoing a major overhaul. The engine runs on Windows, Linux, and possibly Mac OS X in the future. Keep an eye on this one!